In the Linden Hills neighborhood of Minneapolis, a community filled with historic homes and bungalows built in the 1920s, stands a recently constructed “modern” home. To say it sticks out like a sore thumb is pointless, but it is not so obnoxious that I hate it. 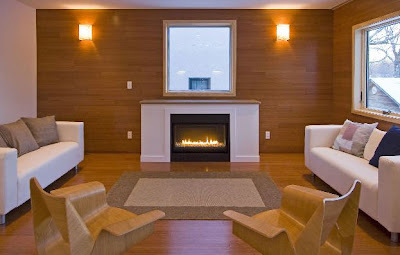 In fact, the warm colors and use of wood take away some of the edge found on many homes with the modern style. Located at 4221 Ewing Ave S in Minneapolis, the original 700 square foot home that graced the lot was torn down and replaced with a pre-fabricated modular building designed by architect Geoffrey Warner. It is comprised of four sections that were made at a factory, shipped to the homesite, and placed atop a concrete foundation. While modern architecture, at least in residential homes, is not easily embraced in the Twin Cities, you can find it sprinkled about the metro area. This home, known as the WeeHouse, has about 2800 square feet. It was sold early 2008 for a price of $749,900. 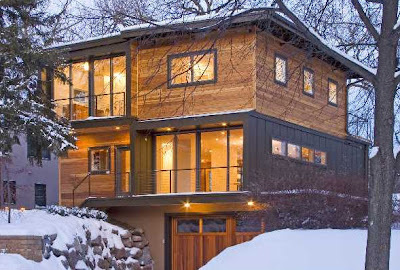 Each Monday, I will be featuring a Minneapolis home that I find interesting. The Weehouse is the first featured home, so please visit often to learn more about home styles in Minneapolis!